I'll be safely at home, not even pondering entering that terrifying frenzy and fray of commercial madness and vehicular hell. No thanks, no way, no how. Is it me, or does Donald Fagen increasingly look like some sort of keyboard vampire? Happy Turkey Day, friends, wherever you are. And seriously, stay home on Friday. Let the nut patrol unleash hell without you. No HDTV or discount iPod is worth living through the Suburban Bataan Death March. And hand turkeys for everyone!! I was sitting in a presentation that was boring the bejeezus out of me and I came *this* close to drawing a hand turkey on top of the hand out. *This* close. I should have done it. I would have been happier. Who doesn't love a hand turkey? 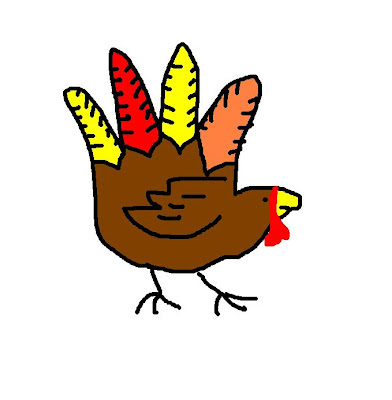 I'm left-handed, so my hand turkeys always face the opposite direction. Thank god I am not the only one who has Steely Dan in her head every time she hears that phrase! I will gladly not leave my house tomorrow.